Events? Connections? Community? Sounds like a good time. Chamber of Commerce Board of Directors meets at the Depot Welcome Center (46 S. Norwood St) at 6pm on the fourth Tuesday of each month. Contact us for more info. City Council meets at Community Service Building Courtroom (48 Warren St) at 7pm on the first Tuesday of each month. Call 706-465-3282 for more info. County Commission meets at Community Services Building Courtroom (48 Warren St) at 4pm on the second Tuesday of each month. Call 706-465-2171 for more info. 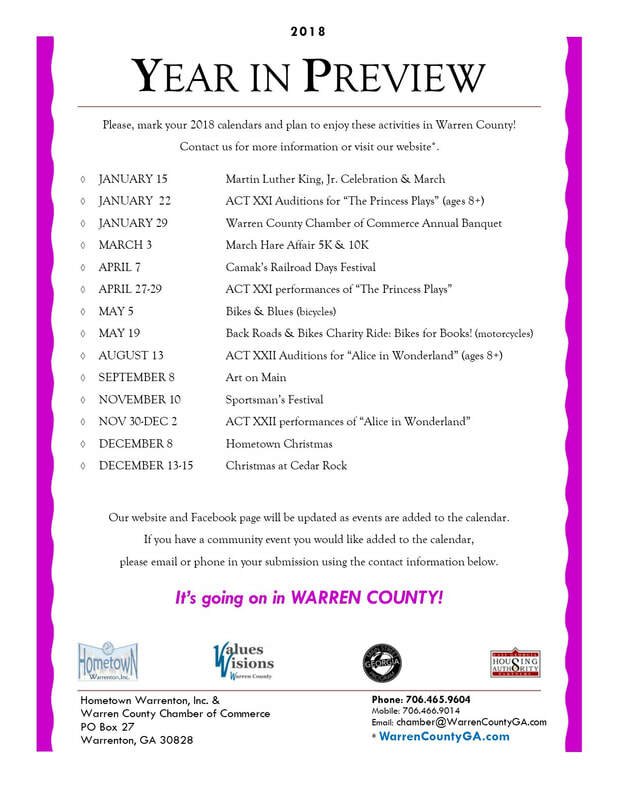 Family Connections & Communities in Schools of Warren County Collaborative Meetings are held on the second Thursday of February, May, August and November* at 10am at the Warren County Human Development Center on McCoy Drive. The November meeting is held at Miss Jane's Restaurant at 11:30am. Call 706-465-1006 for more info. Hometown Warrenton, Inc. Board of Directors meets at the Depot Welcome Center (46 S. Norwood St) at 6pm on the third Tuesday of each month. Contact us for more info.